If you’ve ever been to our practice, you may be one of the many people who have been baffled as we request that you stick out your tongue as we’re discussing the condition that you came in to resolve. In Chinese Medicine, the shape, color, texture and coating of the tongue provide us with a wealth of valuable information. Patients often come to acupuncture with a range of symptoms that may seem unrelated. Rather than just “chasing symptoms,” we are trained to look for the common thread that ties all of the symptoms together. Practitioners of Chinese Medicine commonly use the analogy that the symptoms are “the branch” and that imbalances within an individual’s constitution is “the root.” Looking at the tongue provides insight into what’s happening in the internal environment and helps reveal the mechanism behind a variety of symptoms. The “channels” in Chinese Medicine have traditionally been likened to a system of waterways that brings necessary resources of fluids and nutrients to all areas of the body. Looking at the tongue gives us a map of what is happening in those “waterways.” Specific areas of the tongue correlate with organ systems and areas of the body that may have blockages or a lack of resources. 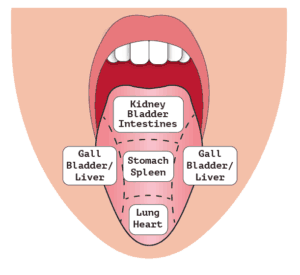 By checking the color of these areas on the tongue we gain insight into what’s happening in the internal environment. The blood, tissues, and fluid of the body all start with the food that you eat. That’s why it’s so important that we address digestive health for the treatment of a huge variety of conditions. By inspecting the shape of the tongue and the “tongue coat” that often forms on the surface, we are able to tell how your body is processing food and fluids so that we can help you to build your resources efficiently. One of the things I’ve always loved about Chinese Medicine is the individualized treatment and diagnoses. When five different people come into my office who have been diagnosed by their doctor with “fibromyalgia” or “IBS” they may be displaying similar signs and symptoms, but could each have a different “root condition” that is causing them to occur. If an acupuncturist is weighing the subtleties between two different diagnoses, inspecting the color, coating, and shape of the tongue will provide an objective insight into the internal environment that could provide clarity to a condition that isn’t straight forward.